I never really was self conscious about my weight. My husband never said anything to me, and until this day he says he loves me for me, not for what I look like. I first started researching weight loss surgery three months after the birth of my son in February 2004. 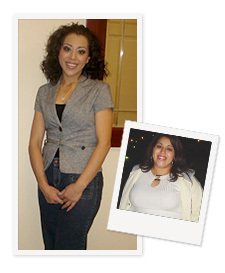 I had been overweight since I was pregnant from my daughter back in 2001. I tried every diet imaginable and even did every single one more than once. After being rejected by three different insurance companies to pay for my surgery, I had given up all hope. I didn’t find the motivation to even think about it. And one day, my dear cousin said, “Jessenia, why not just get a loan for your surgery and it would be like having a car payment only your surgery will be a thousand times more rewarding!” So yet again, I started digging more information up on the modern technology and different surgeons available to me. I must admit that I did not really think I was going to go through with it. My family and I took a family vacation to Knott’s Berry Farm in California in July of 2006. We were having a great time! While waiting in line to get on a roller coaster ride, after waiting 45 minutes to get on, the ride breaks down briefly and a gentleman came on the intercom and advised us that they had no idea how long it would take to repair the ride. People started leaving the line and we decided to stay, not only did we get closer to the front of the line, but the repairs only took 15 minutes. Finally! It was our turn to get on. While my brother and father got in the cart in front of my us, my husband and I were sitting ourselves directly behind them. To my surprise, I was in shock, the seat belt would not snap close. I was too big, way too big to fit in the ride. I was so embarrassed, I quickly ran off the ride watching my family take the joyous ride without me. Even after that, I was not depressed, I was not ashamed of my weight. Instead, I thought to myself, “I AM DONE!”. You know, while traveling in airplanes, it had never bothered me to ask the flight attendant for an extension for my seatbelt so that I could fit in the seat. Not once was that sad, or depressing or life changing. My decision sparked from the moment I was unable to get the adrenaline rush that I so desired from a scary roller coaster ride. Upon arriving back home, I called and made the appointment with Barix Clinics. I had already did all the tests (physical and emotional), questionnaires, blood work, doctor appointments, to prepare me for surgery. All that was needed was a date set in stone and payment. Luckily I qualified for a loan from a local bank and was able to schedule my surgery for five weeks out (this was the soonest they could get me in). At no point in time before my surgery was I afraid or even thought twice about what I was going to do. My life has changed in every possible way. My kids are happier than ever. I can play with them for hours and not be tired or exhausted. My health is at its best and I look forward to living a longer, happier, healthier life. I went from a size 26 to a size 4. I will never have to get off of a roller coaster because of my size again. My size will not slow me down or stop me from the things that I want to do in my life. Bariatric surgery was the best thing that I have ever done for myself. I am healthier than ever and I will live to see my children grow old instead of dealing with all of the medical problems that I had with obesity. Thanks Barix for giving me a second chance at life!